I wanted to clarify a couple things regarding our post on the Lones Group lawsuit on Friday. I wanted to defend my friend Daniel from his attackers. On point number 1, it’s my personal opinion. Nothing more. Nothing less. No good whatsoever will come from lawsuits like the one Daniel is facing now. It’s a waste of time, money, and effort for all of society to endur — and the lawyers win no matter what in the end. I would feel the same way on that subject whether or not I knew the defendant. Regarding point number 2, think of it this way. Imagine someone ran up to your friend and sucker punched them in the stomach Ask yourself two questions. 1) Would you defend your friend? And 2) if you were talking about the matter with another friend a day later, would you give them a neutral account of the incident? I hope the answer to number 1 is yes, and absolutely know the answer to number 2 is “no”. Those who know me well know I’m loyal to a fault, and that certainly played a factor in writing the post as well. There were some strong comments voiced by Kevin Tomlinson and a few others regarding the fact that we were bullying the Lones Group by taking a SEO angle. Everyone makes mistakes, and we’re more than happy to admit we were in the wrong if that’s the case. On careful reflection, we have decided that although we feel strongly that the post itself was well intended, the SEO comment may not have been. Thanks to all for your input and thoughts left in the comments — this is what makes social media such a powerful medium. I have modified the original post as a result. What we were doing with our blog post is defending. What the Lones Group did to Daniel and his family IS bullying. Lastly, please do contribute to the ZebraDefenseFund if you can. Our thoughts are with Daniel and his family and hope this lawsuit is laid to rest soon. Obligatory Disclaimer: I am not an attorney, in any way, shape or form. I consider Daniel Rothamel and his family (also parties to the lawsuit I’m about to discuss) personal friends. And until today, I had never heard of The Lones Group (although I have been around the Seattle real estate scene for about 6 years). Furthermore, I have no idea if they are good at what they do – that’s not the point. Finally, what follows is simply my personal opinion. Before l I start (my rant), a brief recap of the news that hit today — The Lones Group Inc filed a trademark infringement lawsuit against Daniel Rothamel and his family brokerage, Strong Team Realtors, for infringing on their “Zebra Report” and “Zebra Blog”. Supposedly, Lones Group and Strong Team Realtors are in direct competition (even though they are 3,000 miles away) and the fact that Daniel has been known as the Real Estate Zebra for the last 5 years is “unfairly diverting business” from Lones Group. They are asking for $75,000 in damages. Here is the Inman News article: ‘Real Estate Zebra’ hit with trademark suit. In my eyes, The Lones Group just destroyed their reputation with a single strike of their pen and a court filing on Tuesday. Unfortunately, I think it’s safe to say the Lones Group had no clue what deep public crap they’d get themselves into by filing this lawsuit against a blogger as well known and respected as Daniel Rothamel (the real Real Estate Zebra), who has hundreds and hundreds of friends (all of whom have blogs and Twitter accounts) all across the country. Doing what they just did is PURE brand suicide in today’s social media world. A single quote, link, or picture can reach millions of eyeballs within minutes. Like it or not, that is the way our intertwined world operates. Companies can operate within that framework, or cease to exist. And Lones Group is now suffering the consequences. You would think an Internet Marketing Company would know this? The Lones Group lost the online fight for the Zebra brand name (if there ever was one) in the ONLINE real estate space. The fact that someone would rather file a lawsuit rather than figure out how to settle their matter privately is a disgrace. But, hey, maybe that’s just me. To win in life and business, you’ve got to show up. And if you lose? Learn from your mistakes and move on. Don’t file a stupid lawsuit; it’s a waste of everyone’s time and money. As I’d said before, business and life comes down to execution. Daniel succeeded with branding himself. The Lones Group didn’t. Competition should be motivation for you to get better. Not motivation for taking legal action. Last, but not least, if you want to help Daniel defend himself, you can donate to his defense fund at ZebraDefenseFund.com. All extra proceeds will go to charity. WordPress: You want your website to be built on WordPress to take advantage of it’s ease of use, blogging capability, SEO friendliness, and long term flexibility. SIMPLE: Above all, you want something that’s simple and just WORKS. You don’t want to deal with the headache of setting up & customizing WordPress.org on your own. And you want a simple interface to manage your entire site. Beautiful, professional design: You want to make it clear to buyers and sellers that you are serious about your business. You know first impressions matter, and even more so online than in person because it’s so easy for someone to click over to someone else — and never to be “seen” again. Built with conversion & SEO in mind: You know that if your website is not converting your traffic to leads and clients, then you’re missing out. Yes, you want a professional design, but you want a site that generates business and maximizes the chances you’ll attract organic SEO traffic if you are putting time and energy into creating unique content. And last, but not least, you want it to be affordable. Does this sound like you? If so, we have just the product for you. Our brand new Predesigned Websites that Work wordpress platform. For $699, we handle your website setup and it’s up and running within days with zero hassle. It’s simple, professionally designed, and built with results in mind. 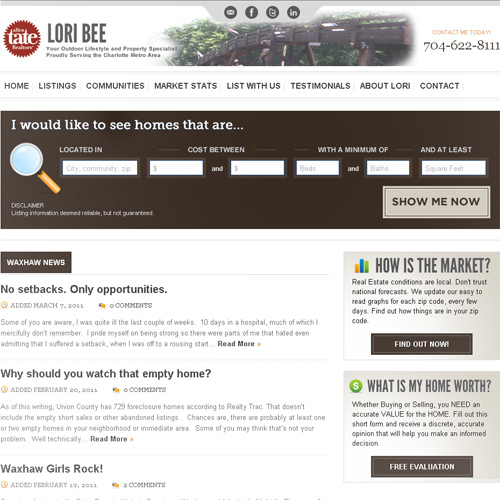 We manage your web presence so you can focus on what you do best — selling real estate. You’ll still want to add content to your site to generate traffic and build engagement with your audience, but we take the guesswork out of the setup, design, and activation step. Our predesigned sites have a monthly charge of $99, which covers support, automatic upgrades, security fixes, hosting, dsIDXpress, and Altos Research “lite”. Lori was the absolute FIRST person we signed up for our BETA program back in late November. Her feedback and patience throughout the process has been invaluable to us along the way. Though we had to go through a few iterations of her branding (she recently switched to Allen Tate), we’re absolutely thrilled with the way her site turned out. 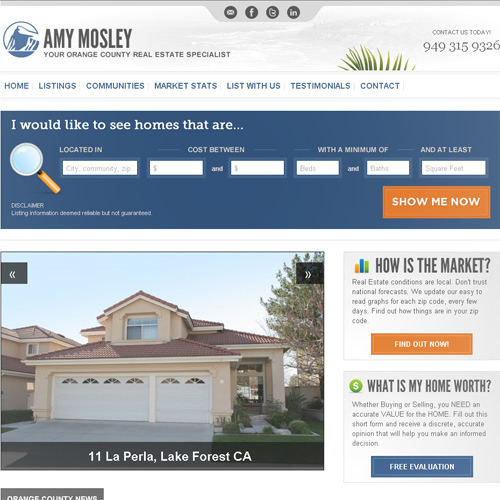 Amy Mosley & Steve Craig – This was our 2nd signup. I knew Steve and Amy from their time with YouReach Media last spring and summer (at the time, I was working for YouReach part-time). They’ve been amazingly patient with us over the past few weeks as our first “live” site sitting on an external domain. They have 2,100+ pages indexed on their domain already, which is awesome to see! The WordPress theme you see on these two sites, which we’ve named “Under Pressure” (after the Queen song), is only the first theme on our platform. This theme is currently available in 10 different colors. We’ll be adding entirely new themes as we go, and certainly be announcing those new themes here on the VR Blog when they are released. We have a number of additional sites just about ready to unveil, but waiting for a few IDX activations & a bit more content to be added to them before showing them off. Do It Yourself WordPress.org – Frankly, we’ve really yet to see an agent pull this off and build a PROFESSIONAL looking website on their own. But feel free to try. Template or Predesigned w/ Customization – price range varies from $500-$3000 depending on level of customization. And if you are dealing with a freelance designer or developer, be prepared to spend a considerable amount of time going back and forth getting the website to look the way you want it to. No one is telling you that you can’t learn the ins and outs of setting up and customizing WordPress; you can. But the trade off is your time. You can spend your time learning WordPress, or you can spend your time selling real estate and building your sphere. You decide what’s a better use of your time. If you know Jim Marks or me, you know selling low quality products just to make money doesn’t get our juices flowing. 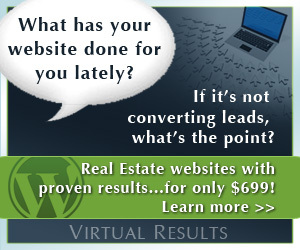 We are not here to beat all our competitors with the lowest priced WordPress offering available, we’re here to knock your socks off with the best damn real estate sites available anywhere on the web. 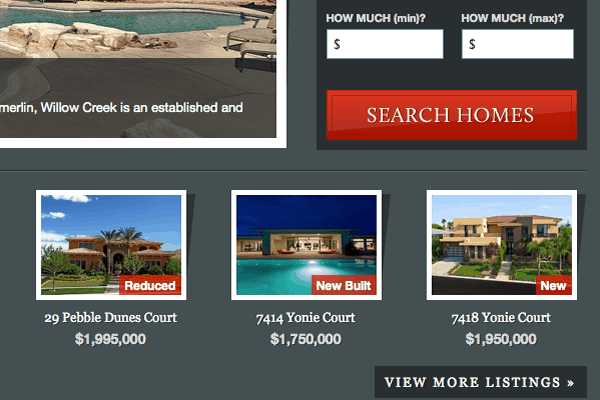 These websites ARE the best real estate website product available under $1,500. Bar none. What are you waiting for? SIGN UP for your site here and have a professionally designed blog working & functional by Monday (*IDX approval in some areas may take longer)! You can take a look at our FAQ page and product overview if you want to learn more about the features and benefits of the predesigned websites. If you have questions beyond that, feel free to give us a call at 206-395-6338. If you made it this far, you’re obviously somewhat interested in upgrading your website in 2011 — and we’re going to off you a special reward for reading every last word of this post. Enter the discount code “websitesthatrock” in the form above and you’ll receive $25 off the setup cost – for a limited time only. If you are a Virtual Results client, and LOVE Facebook (who doesn’t), please join our brand new Facebook group! The group is a closed group, so you HAVE to be a Virtual Results client to be a member. This is an exclusive Facebook group for Virtual Results clients to exchange ideas, connect with each other, and keep up to speed with the latest and greatest internet marketing, social media, and website tips and tricks from the Team at Virtual Results! ASK TO JOIN THE GROUP HERE. Note: If you want to turn off email notifications (which are on by default) and still be part of the group, you can do so by clicking “edit settings” from the group landing page. Screen shot. Not a Virtual Results client yet? What are you waiting for?